The ‘Hieroglyphics’ of Horapollo is the only true hieroglyphic treatise preserved from classical antiquity. It consists of two books, one containing 70 chapters and the other 119; each dealing with one particular hieroglyph. The relationships between sign and meaning were, according to Horapollo, always of an allegorical nature, and it was always established by means of ‘philosophical’ reasoning. 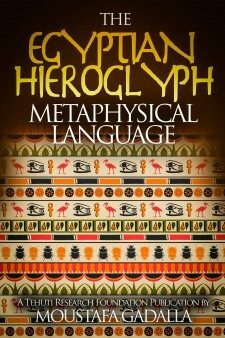 Accordingly, each Egyptian hieroglyph has a short heading describing either the hieroglyph itself in simple terms (as, for instance, ‘the explanation of the picture of a falcon’), or else stating the nature of the allegorical subject to be explained, such as ‘how to signify eternity’ or ‘how to signify the universe’. “The Egyptian Hieroglyphic, of which one aspect is by the first elements is literal, and the other Symbolic. “Wishing to express Sun in writing, they make a circle; and Moon, a figure like the Moon, like its proper shape”. by changing and by transforming in many ways as suits them, they draw characters”. Clement, like ALL classical writers of antiquities, asserted that the Egyptian hieroglyphics represent true images of the divine law. The relationships between sign and meaning were always of an allegorical nature, and it was always established by means of ‘philosophical’ reasoning. In fact, these categories describe relationships between visual forms and their meanings. A visual form may be mimetic or imitative, directly copying features of the object it represents; it may be associative, suggesting attributes which are not visually present such as abstract properties incapable of literal depiction; and finally, it may be symbolic, meaningful only when decoded according to conventions or systems of knowledge which, though not inherently visual, are communicated through visual means. – by each’s specific employments in the various contexts. The rules governing the conception of allegories and symbols, with their subtle distinctions between cyriologic, tropological metaphorical, anaglyphical, and enigmatical comparisons, made such symbolic interpretations possible. Such hieroglyphic expoundings combine the total religious, philosophic, and scientific knowledge into a grand vision of a living cosmology. This is the basis of the ‘theory of correspondences’, and indeed of all traditional symbolism in which a true symbol is imbued with some of the power of its original. Contrary to the anthropological view of the origin of symbols in mere similarities, this doctrine regards them as primary realities whose actual relationship is perceived by man’s higher intellect. The ideogram is an accurate mode of depicting reality. The traditional interpretation of communication purports to treat the material sign as the mere appearance of an underlying ideal reality. Depiction is not synonymous with copying nature; ideogrammic writing is mimetic only in the sense that it attempts to enact natural processes. The difference between pictures and world is that the world is ‘the sum-total of reality’, but a picture only ‘represents a situation in logical space’. 2) Pictorial symbols, which are used to suggest abstract ideas.